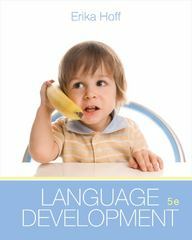 Language Development 5 Edition Erika Hoff's LANGUAGE DEVELOPMENT, 5th Edition communicates both the content and the excitement of this quickly evolving field. By presenting a balanced treatment that examines all sides of the issues, Hoff helps readers understand different theoretical points of view-- and the research processes that have lead theorists to their findings. After an overview and history of the field, Hoff thoroughly covers the biological bases of language development and the core topics of phonological, lexical, and syntactic development. She also provides in-depth discussions of the communicative foundations of language, the development of communicative competence, language development in special populations, childhood bilingualism, and language development in the school years. Available with InfoTrac Student Collections http://gocengage.com/infotrac.